Lightning McQueen and Mater, our oldest son's toys. Cars 2 has had approximately 7,874 Wii owners report game-play hours in the 54 days from June 21 to August 15. 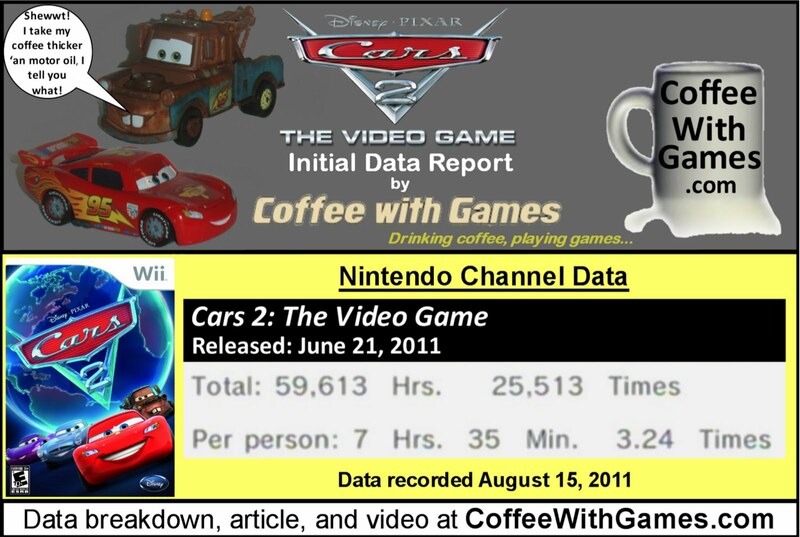 Cars 2: The Video Game has 59,613 Total Hours of game-play reported, with an average play-time of 7 Hours 35 Minutes "Per person" reporting data. The game's average play-time is 2 Hours 20 Minutes per day/session reported. Cars 2: The Video Game has an Amazon.com sales rank of #125, and it is currently discounted 30% off its MSRP and is selling for $34.99. Cars 2: The Video Game has a "professional" review score average of 69.42%, based on 6 reviews on GameRankings.com. The game has a 4 out of 5 Stars rating on Amazon.com, based on 13 customer reviews. Cars 2's customer review score average is 84.61%, when the reviews are converted to a 100% review scale. I have not played Cars 2: The Video Game, nor have I seen Cars 2 the movie...but I have "watched" Cars, the original movie, probably 100+ times in the last few months with our oldest son. Lightning McQueen and Mater in the banner and data image above, are actually two of our son's Cars toys! Our oldest son loves the Toy Story movies, and Cars. I have been tempted to purchase Cars 2: The Video Game to see how he would react to it, and because I'm curious if he could learn to play it...or if he would just continuously crash and run off the courses. Did you all see the coffee cup! Okay, there could have been tea in it, but I didn't see a tea bag string...perhaps, I can find out from the developer. I think it's pretty impressive that Cars 2: The Video Game has had hours debut in less than 2 months since it released, especially considering the Wii version does not feature online multiplayer. I think the game's average time per day/session that it is played, 2 Hours 20 Minutes, is really impressive and shows that the game is not necessarily being played just in short, quick sessions, and perhaps the local multiplayer feature is getting some good use. Since I have kept to my "New Year's Video Game Resolution" so far, I don't think I'll be purchasing Cars 2: The Video Game, though a rental of it may happen. Have any of you played Cars 2: The Video Game? If so, what do you think about the game, good and/or bad, and what system did you play it on? Also, are any of your kids seemingly hooked on Toy Story movies and Cars, or just Pixar movies in general, like our two year old son? This seems to be the only movie game that is actually half-decent. I'm looking at you, Green Lantern! But again, this is Pixar, and they can do things right with both movies and their video game companions! @The Strikester - good point. Movie tie-in games just make me cringe on principle most of the time, but Pixar's last two games were pertty solid. Yea, I don't know what it was about Cars, but the racing/vehicles really "clicked" with our son, and he loves it. Toy Story 3 is on my bad list, though I think the movie good...it just ruined our son playing with his toy train set. I haven't heard anything, good or bad, about Green Lantern. Which version did you try? Cars is my most favourit animation movie, I really like it's effect and it story was also very nice. I love this movie! Hope I'll be able to play this game. But I'm wondering why and age limit of 10? Cars is very nice animated movie. I really enjoved watching this movie.